Go to Control Panel and open Ease of Access Center.  Turn on Mouse Keys – This option sets Mouse Keys to run when you log on to Windows. Instead of using the mouse, you can use the arrow keys on your keyboard or the numeric keypad to move the pointer.  Turn on Sticky Keys – This option sets Sticky Keys to run when you log on to Windows. 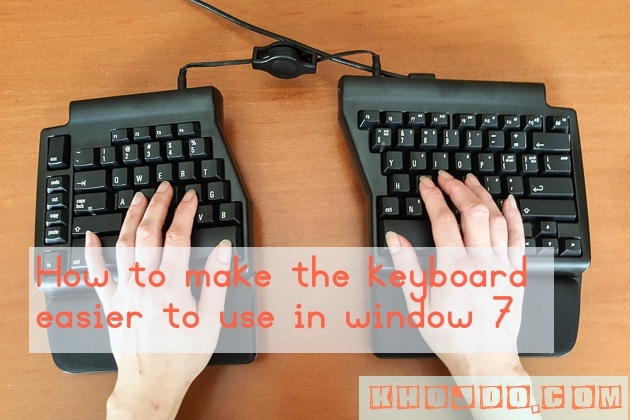 Instead of having to press three keys at once (such as when you must press the Ctrl, Alt, and Delete keys together to log on to Windows), you can use one key by turning on Sticky Keys and adjusting the settings. This way, you can press a modifier key and have it remain active until another key is pressed.  Turn on Toggle Keys – This option sets Toggle Keys to run when you log on to Windows. Toggle Keys can play an alert each time you press the Caps Lock, Num Lock, or Scroll Lock keys. These alerts can help prevent the frustration of inadvertently pressing a key and not realizing it.  Turn on Filter Keys – This option sets Filter Keys to run when you log on to Windows. You can set Windows to ignore keystrokes that occur in rapid succession, or keystrokes that are held down for several seconds unintentionally.  Underline keyboard shortcuts and access keys – This option makes keyboard access in dialog boxes easier by highlighting access keys for the controls in them.